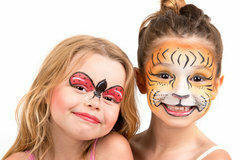 Chicago's Premier Face Painting Artist Our expert artists will provide you with professional & amazing designs. Expect only the very best for your next event. 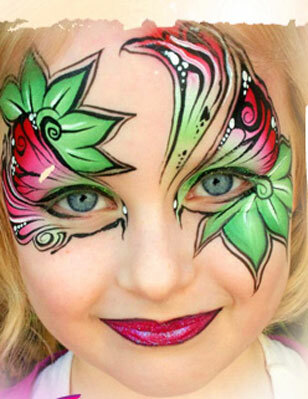 Glitter Tattoos, Face Painting & Airbrush designs. Transform any event into an amazing experience. There is a $50 non-refundable deposit to reserve, since the artist will be scheduled for the date of your event, and will not take any other reservations for that particular date. The deposit cannot be applied to another date. Depending on the design we can do 6-10 faces per hour. Minimum 2hr Rental. The paint we use is non-comedogenic and safe to use even on the most sensitive of skin types, is also easily removed with soap and warm water. Worried about it ruining any fabrics in your house? Don’t be, the paint dries in seconds after it’s applied. Not to be confused with the traditional forms of turning children or adults into mystical creatures and animals. This new age form of face painting takes half the time too. Though for those who prefer the traditional style of face paint our artist does offer that as well. Looking for some added sparkle to your day? Now introducing Glitter tattoos whether its dragons, fairies, peace signs, or hearts and such. Special glue formulated to hold the glitter for 5-7 days. Our artist includes an assistant to avoid long lines, fully equipped with paint and glitter in hand. Try out for yourself today! Customized Designs Available!